If there’s a North American insect that qualifies for the label “charismatic,” it’s the monarch butterfly. People who recognize no other butterfly by name know monarchs, and many even remember some of the things that set them apart from other insects: the fact that each fall a cohort migrates from as far north as Canada to a single mountain forest in central Mexico; the fact that monarch caterpillars are unpalatable to would-be predators because they feed exclusively on milkweed plants; the fact that their striking coloration as both caterpillars and adults warns predators away, and is mimicked by other butterflies that are not actually toxic. Fewer people are aware that, like many other charismatic creatures, monarchs are declining rapidly as a species—by a staggering 90 percent over the past two decades. The wintering population of monarchs in Mexico is estimated according to the amount of forest they occupy, and this year that area was only 1.7 acres. That’s a record low, and it’s less than half of last year’s area, which was itself a record low. Worse, these low numbers are in line with long-term trends. When faced with such news, many people ask first, “What can individuals do to help?” The frustrating answer to that question is typically, “nothing.” No matter how far a person goes to reduce her own carbon footprint, for example, she’s not going to preserve polar bear habitat on her own. The accompanying photo by the author depicts an adult monarch nectaring on butterfly milkweed in his home garden. Butterfly milkweed is even more important as a source of food for monarch caterpillars, which feed exclusively on milkweed. The case is somewhat different with monarchs, though, because people can provide important habitat for them in home landscaping—just by cultivating some milkweed for monarch caterpillars to feed on as they mature. Before you turn your nose up at the idea of installing a plant with a name that includes “weed,” be aware that some members of the milkweed family are quite pretty and well-behaved, completely at home even in the most conventional flower garden. 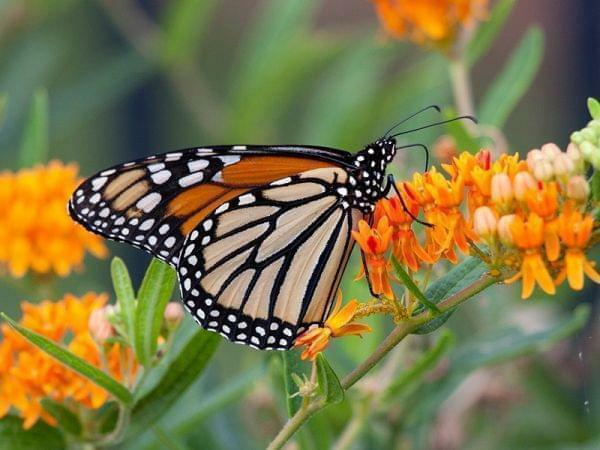 That’s especially true of the species commonly called “butterfly milkweed.” Butterfly milkweed is an easy-to-grow perennial characterized by attractive foliage and bright orange flowers. I’ve planted everywhere I’ve lived over the past two decades, and the monarchs have never failed to find it. Fortunately for residents of east central Illinois, an opportunity to buy butterfly milkweed is upon us. It’s the annual native plant sale conducted by the local land conservation group Grand Prairie Friends. I spoke recently with James Ellis, board president for the group, and he assured me they hundreds of butterfly milkweed plants ready to go. In addition, he pointed out, they have also cultivated another milkweed species for sale this year, Sullivant’s milkweed, which is a taller, slightly wilder looking cousin whose flowers come out in a pinkish-purple cluster three inches across. I should emphasize that in addition to the two milkweeds, more than 60 other species of perennial plants native to our region will be available at the sale, including wide varieties of both grasses and flowers. While these may not host monarch caterpillars, they benefit other native insects in ways exotic plants do not. This, in turn, provides an important benefit to all wildlife of our area, because insects are a source of food for so many other creatures. Details about the sale including a complete list of plants available are can be found at http://grandprairiefriends.org.